The timing has changed since our last post. We are now looking at a minor event for Tahoe late on Monday night. I believe there is a possibility for 4-8 inches of snow at Rose. 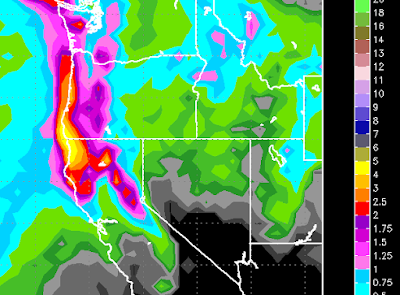 Northern California will pick up another nice dose of rain. However, this system is small and weak. Looking ahead, our persistent ridge if high pressure moves in and begins to dominate our weather for at least the next week. As you can clearly see, some beneficial rains for Northern California.The Carson range could get up to an inch of the liquid precip, which could translate into around 8 inches of snow. It is going to get windy as the storm moves through, but I think the lifts will spin Monday morning and Tuesday morning as the timing of the storm and winds appears to be late Monday into very early on Tuesday. Winds will pick up all day Monday as the storm approaches and then die down as the cold front moves through.